Hubby and I visited Koka Ninjutsu Yashiki on 4th January. 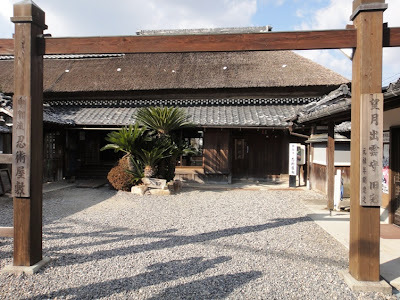 Koka Ninjutsu Yashiki is a house which was constructed in the Edo period about 300 years ago as the residence of Mochizuki Izumonokami, leader of the Koka ninja clan’s 53 families. The house is located at its original site in Koka city of Shiga prefecture. The house is owned and maintained by a local medicine company having ninja roots, and is the only genuine existing residence of ninja. This house is an impressive and authentic historical building that has been conserved and opened to the public. 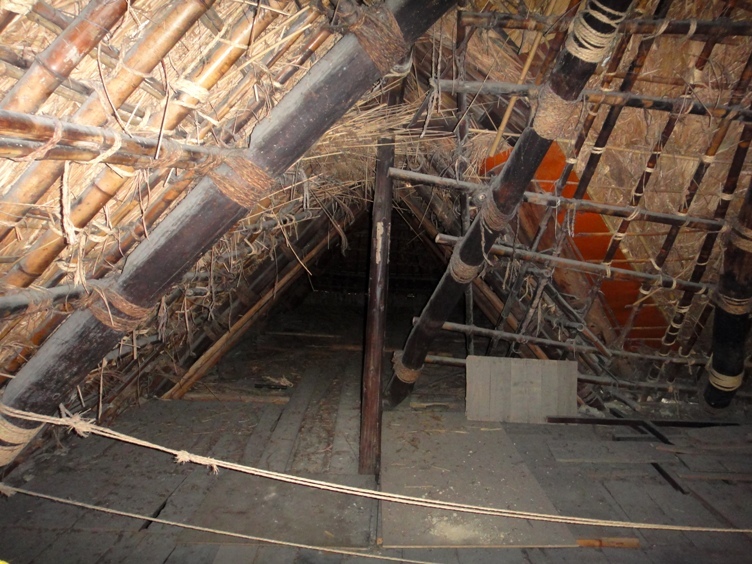 From the outside it appears to be an ordinary one-storied Japanese-style house with a thatched roof, but on the inside it is a complicated three-storied structure that is full of many traps and devices designed to protect against intruders. 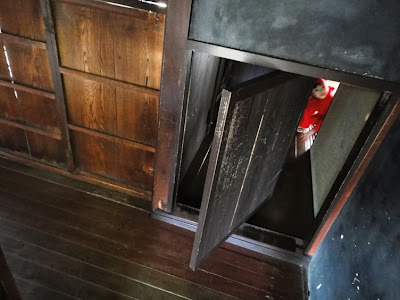 The house has revolving walls, pit traps, trick windows, secret underground passages, hidden rooms, and a rope ladder to protect oneself from any outside attacks. 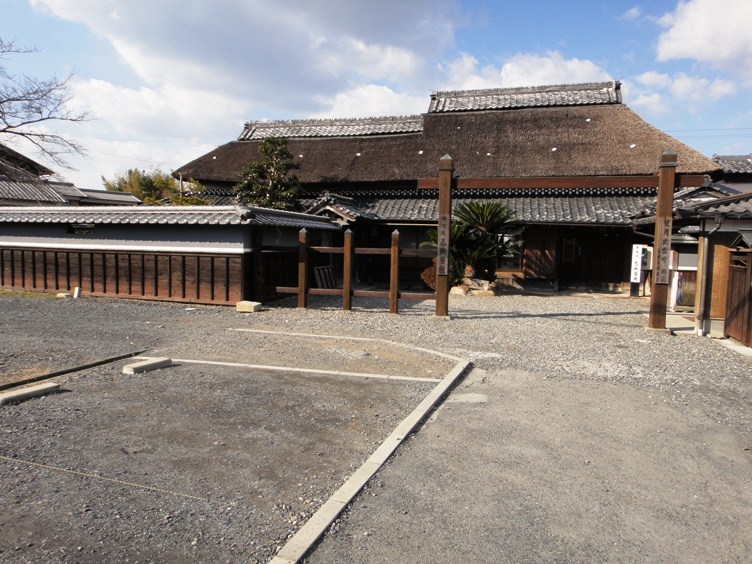 ‘Koka’ is the correct pronunciation of the Japanese kanji characters used to write the name of the house. 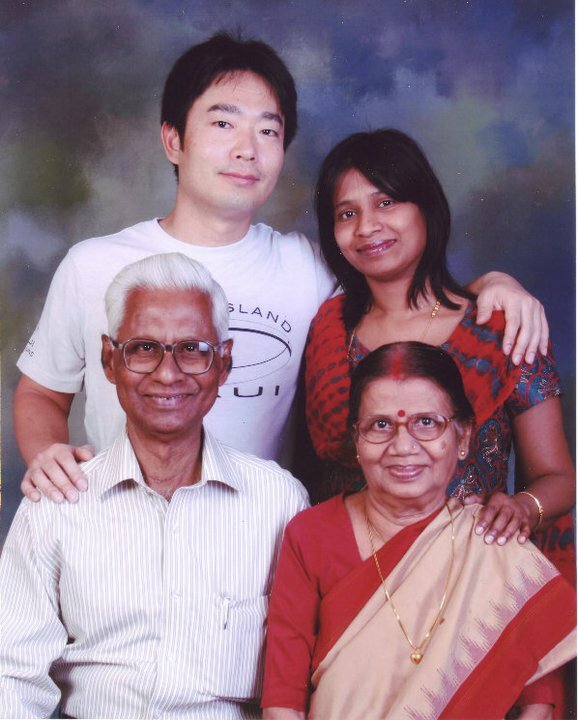 But it can also be pronounced as ‘Koga’, which has become more common nowadays. 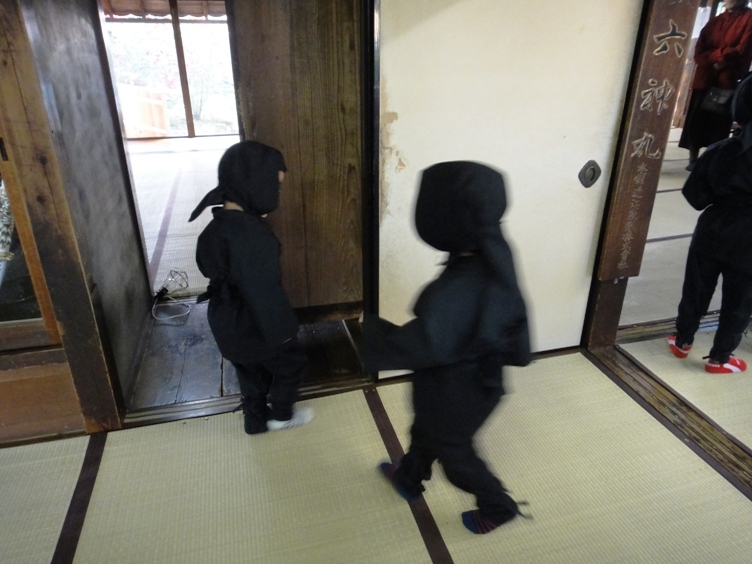 Ninja were the warrior spies trained in a special kind of physical art called ninjutsu. 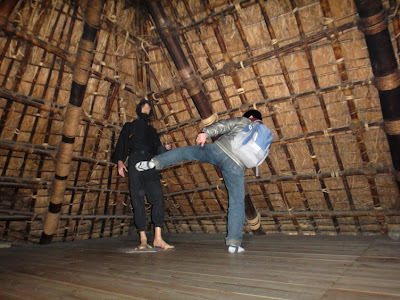 Ninjutsu is the art of stealth that involved the ninjas to sneak unnoticed into enemy camps or people's houses, and also use visual tricks to escape. 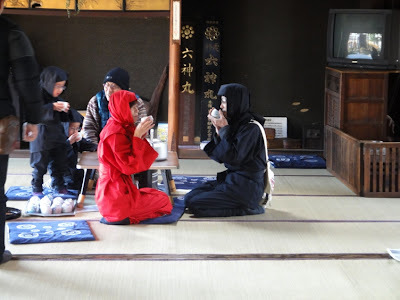 Ninja disguised themselves so as to conceal their identity. Ninja served those in power and carried out missions such as secretly finding out the strategies and military capabilities of enemies, destroying their weapons, and sabotaging and assassinating the enemy leaders. Ninja were predominantly active in the Sengoku period during the sixteenth century feudal era. 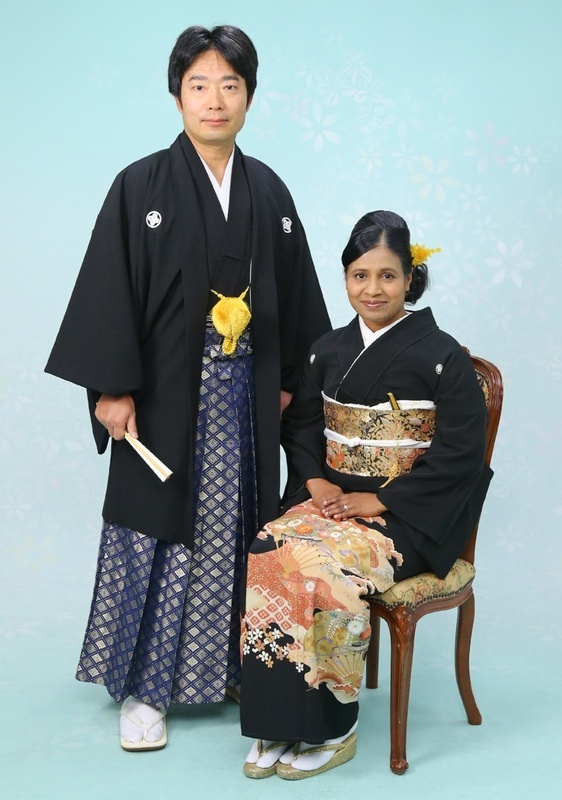 They no longer exist in Japan today. 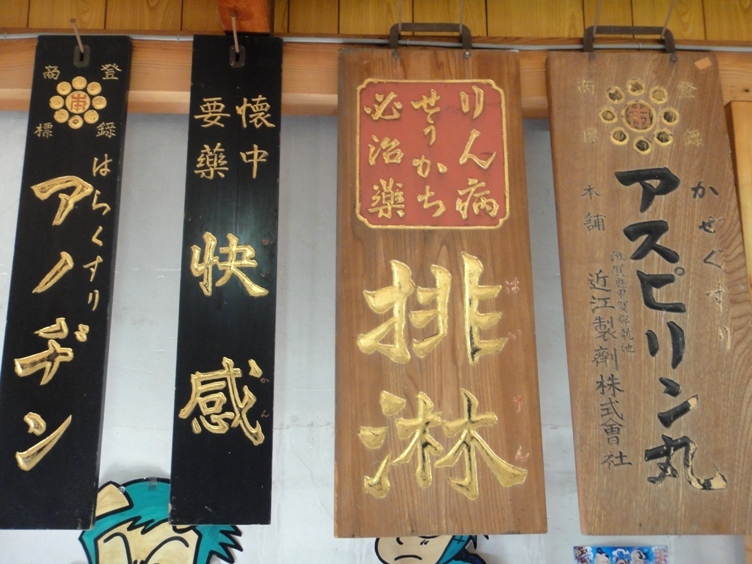 There were many schools of ninjutsu during the feudal era. The two most famous main styles of ninjutsu were Koka ninjutsu which originated in Shiga prefecture and Iga ninjutsu which originated in Mie prefecture. Koka ninjutsu specialized in the use of guerrilla warfare tactics. 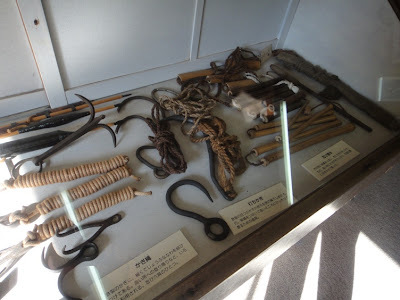 Many Koka ninja were makers of medicine as a front for their clandestine activities. This background made them expert in the use of chemicals and gun powder making. At Koka Ninjutsu Yashiki house, visitors can experience the ultimate refined stealth techniques of ninjutsu martial arts that were developed over the centuries. 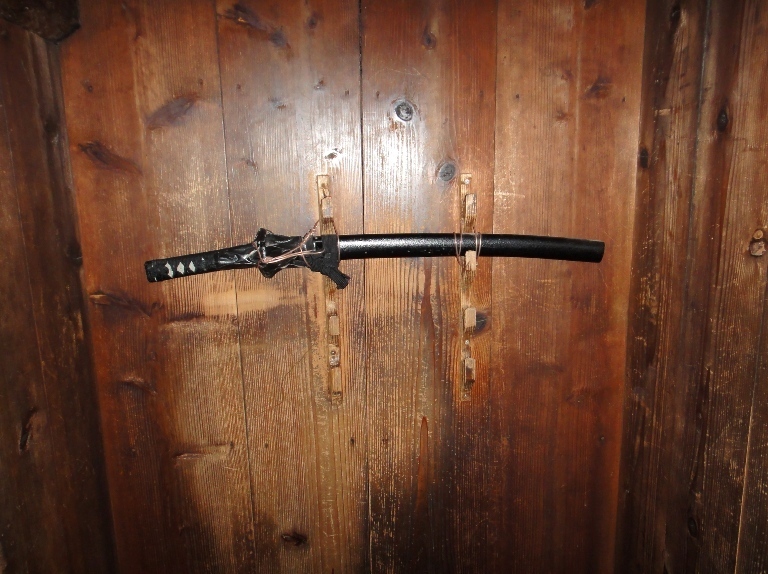 At the house we can get the glimpse into the reality of the ninja who once trained, fought, and lived real lives in feudal Japan. In fact, there is a big difference between the superhuman image we have of the ninjas and what they really were. 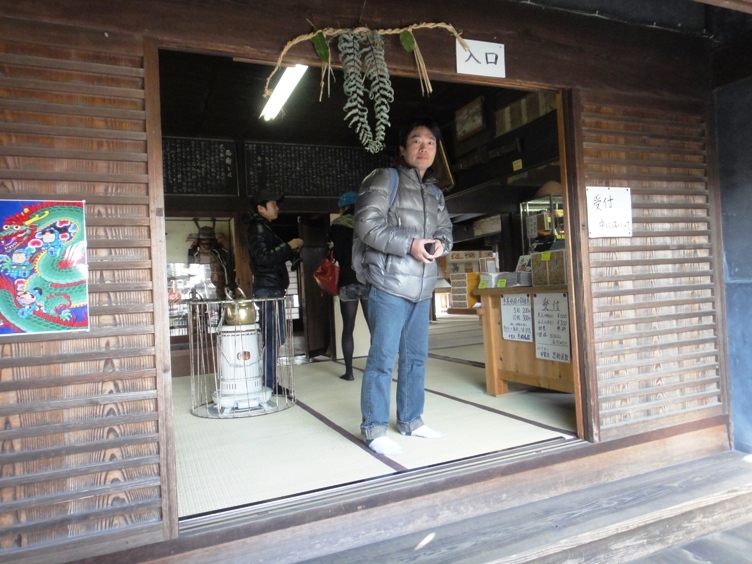 In the morning of 4th January, hubby and I went to see Lake Biwa Boat Race in Biwa city of Shiga prefecture about which I have written the previous post. 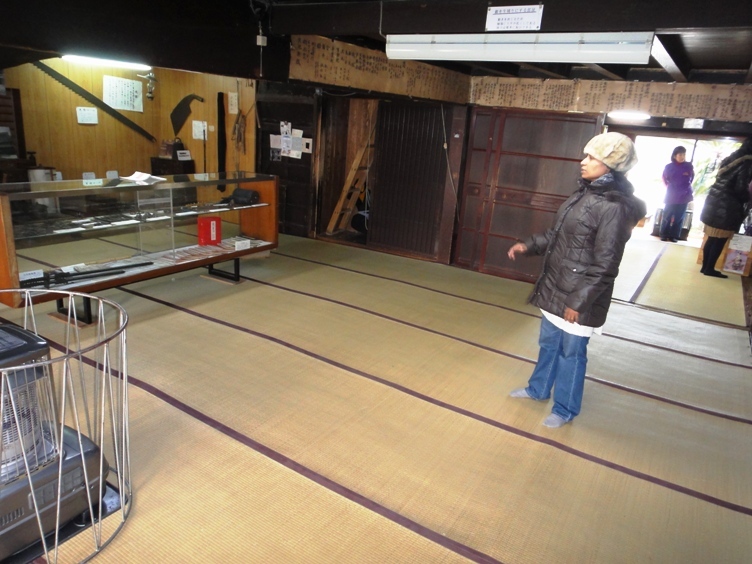 At about 12.30 pm we left the boat race building and next visited Koka Ninjutsu Yashiki house in Koka city of the same prefecture. 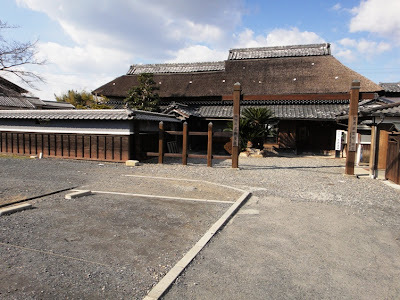 The ninja house is located about 40 kilometers east-southeast of the boat race place and it took us 40 minutes to reach the house by car. After parking our car at a parking lot, we walked for about 10 minutes and reached Koka Ninjutsu Yashiki house. 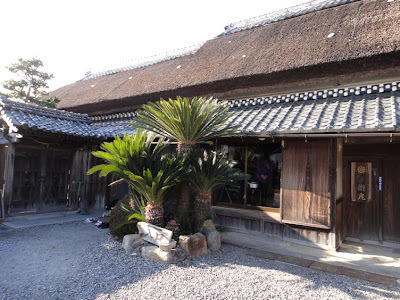 The house looked like a traditional Japanese-style house with a thatched roof. In front of the house, there is a life-sized ninja cutout that looked so cute. 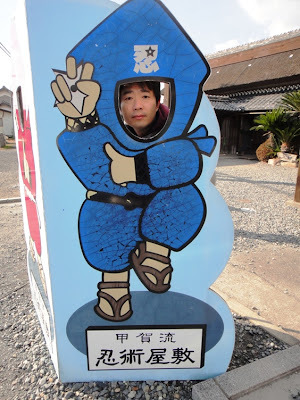 I took a photo of hubby posing as a ninja. At the entrance of the house, we paid 600 Yen per person as admission fee to enter inside and experience the lifestyle and secretive world of ninja. The first room on the first floor of the house is the living room. 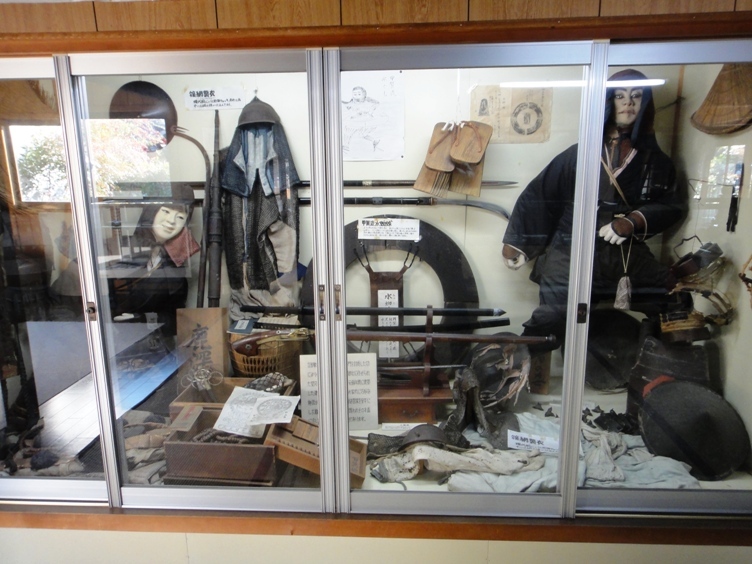 This room has several display cases showing various ninja weapons, tools, and costumes. 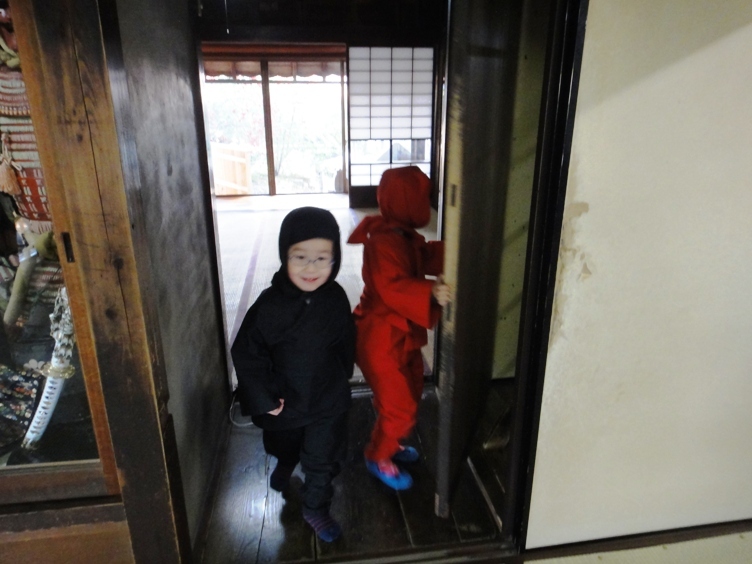 Visitors can rent ninja costume in red or black colors for 500 Yen, and dress up like a ninja and tour the house. We saw a couple and many kids dressed as ninja. They all looked so cute. While waiting for a guided tour of the house, visitors can sit and have free kenpocha health promoting ninja tea. 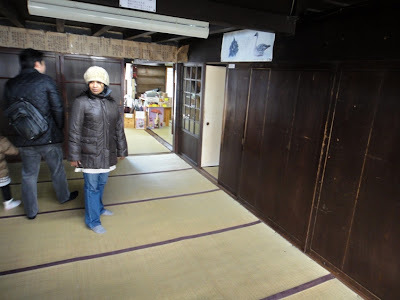 There is a souvenir shop at one corner of this room. 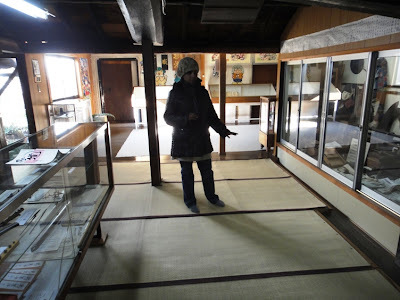 Next, we went to the second room on the first floor but decided to see the details of the displayed items of this room at a later stage. So we tried to enter the third room on this floor. The sliding wooden doors between the second and the third room are one of the trick doors of this house. These wooden doors are thick and very heavy, and weigh about 50 kilograms each. An intruder would have found it very difficult to open these heavy doors which could have bought more time for the ninja to escape from an underground passage in the third room. Furthermore, there are door pull handles on these heavy doors towards the outside while there are no handles inside. So the third room could also be used for trapping an intruder inside. There are no door pull handles towards the inside of the heavy doors. 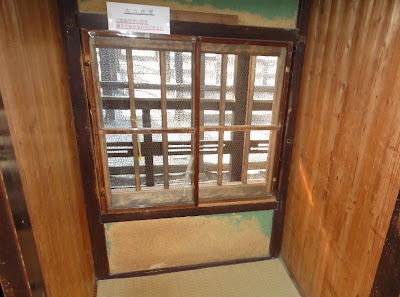 This photo is taken from inside the third room. The third room is a wonderful room that has many secret doors and traps. 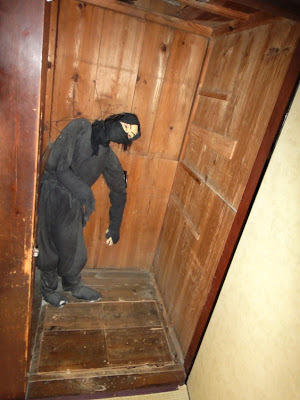 There is a pit trap under the floorboards between the third room and the first room that only the ninja owners of the house knew about. 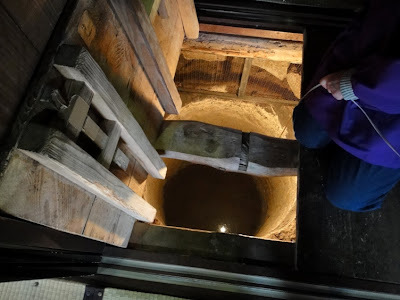 The floorboards has a trap door from where the ninja could go down into a six meters deep pit and escape through an underground passage that leads to a well in the garden outside. 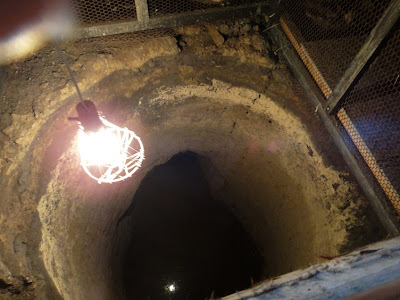 So we saw some water in this pit. Sometimes enemies were lured to the trap area where the floorboards gave way and they fell into the pit. 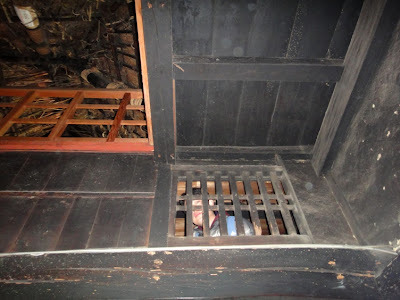 In the third room, the wall next to the pit trap floorboards is revolving kind which was used by the ninja to hide. When closed, it looks like an ordinary wall of the house. But this wall is actually a revolving door. 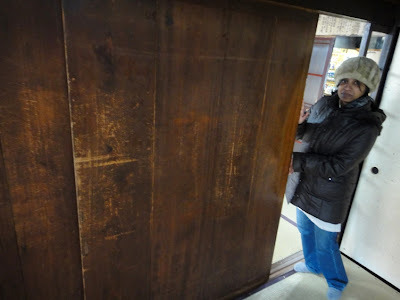 When hubby stood against this door (or the wall) and leaned a little, the door swung around and he disappeared in an instant. In addition, in this room there are two closets with revolving doors and pit traps that were used by the ninja to hide or escape. Hubby and I tried to open the revolving door of one of the closets and played hide and seek. It was so much fun. In this room, there is also an interesting trick window. This window is usually in a closed mode because of a hidden hook in the left side sash that falls into a groove in the left side jamb due to gravity. An outsider is unable to see and understand such an intricate mechanism and finds it impossible to open this window. The trick to open this window is by sliding upward a thick paper or a sheet through the spacing between the side jamb and the window sash which unlatches the hook from the groove. 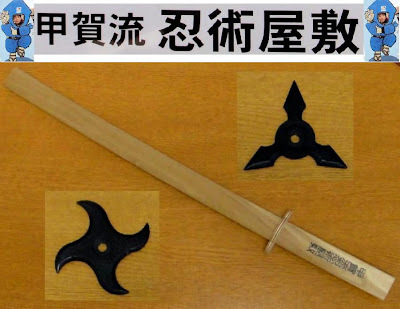 It is a very simple trick technique but was very useful for the ninjas to escape. 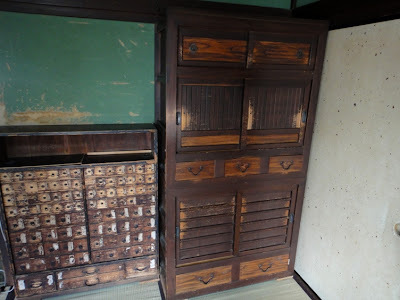 Many Koka ninja were makers of medicine as a front for their spy activities, and so we saw a medicine cabinet and a chest from the Edo period in this room. 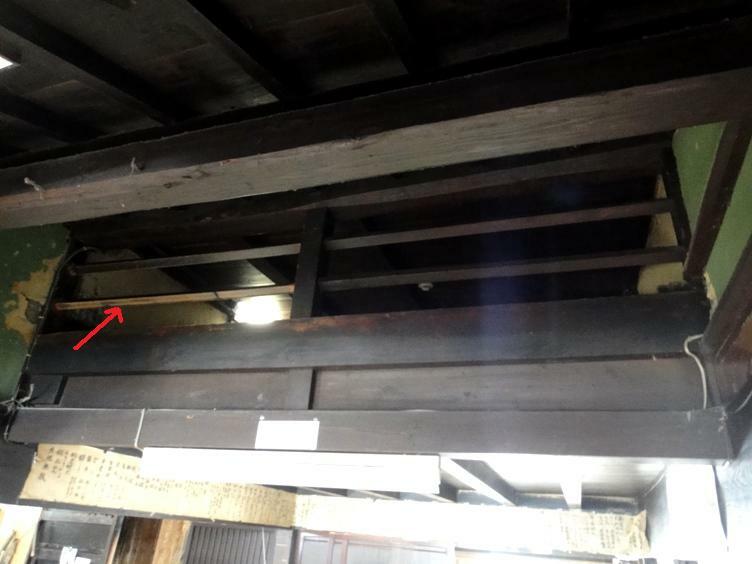 Kids dressed as ninja are standing on the floorboards above the pit trap. One of them is opening the revolving wall (door). 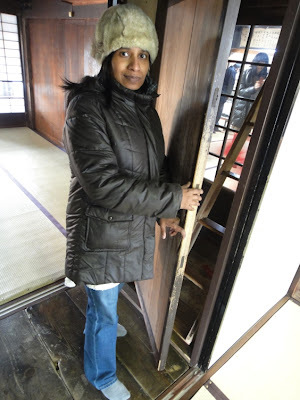 Next, we returned back to the second room on the first floor. 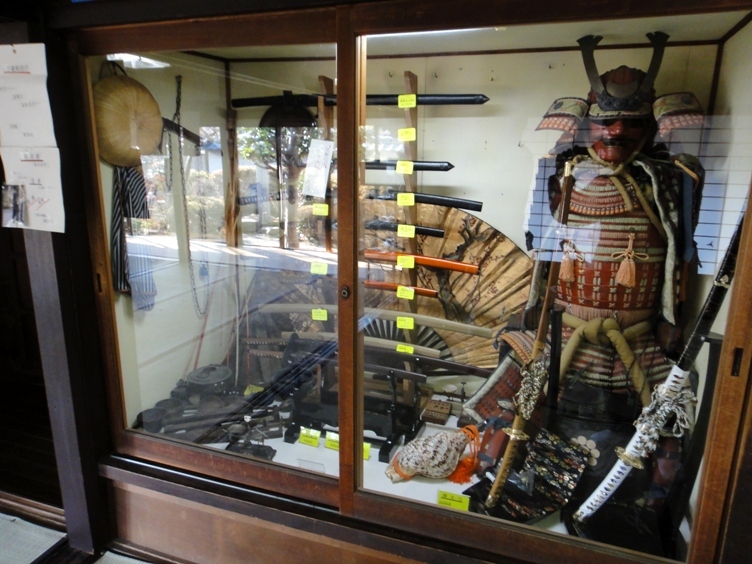 In the center of the room, there is a display case showing various arms and ammunitions used by the ninja. This display case has four sections. 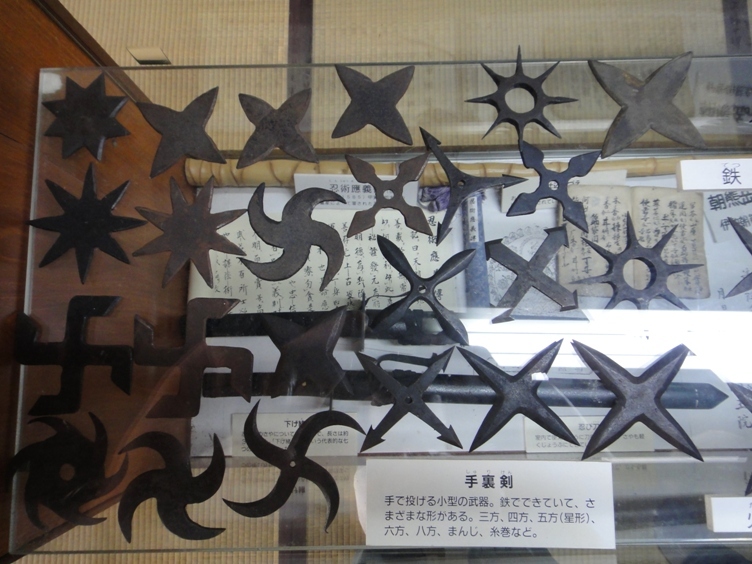 In the upper left section of the display case, real Shuriken throwing knives made of steel and having different shapes and designs are displayed. We liked the star-shaped and dart-shaped Shuriken. 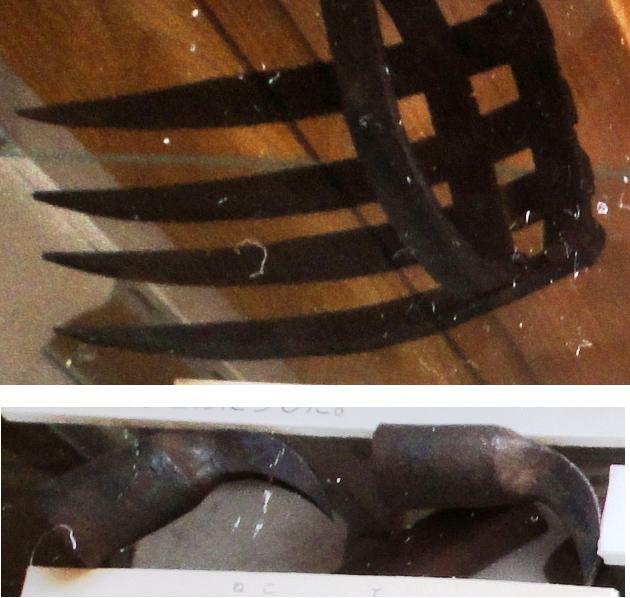 In the lower left section of the display case, very short ninja swords are displayed. 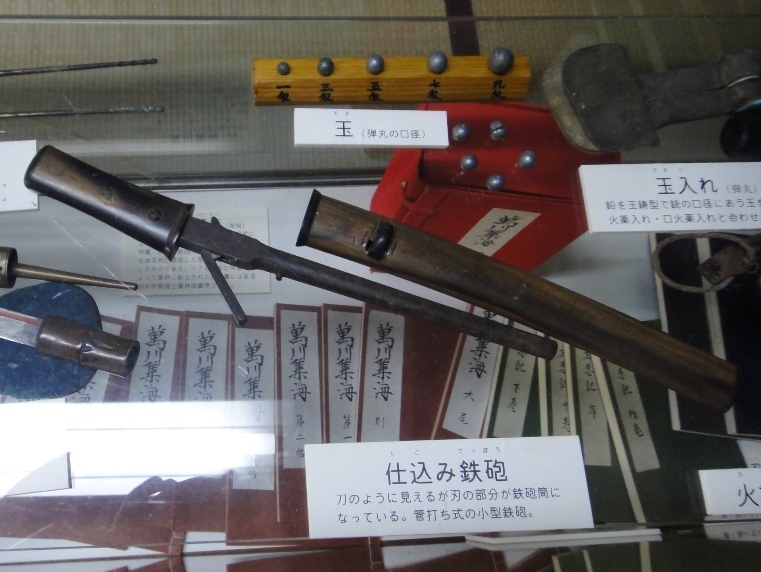 In the upper right section of the display case, gunpowder-case, bullets, and guns are displayed. In the lower right section of the display case, replica of the famous Bansenshukai notes detailing ninja tools and techniques are displayed. We loved the display of various weapons and ammunitions which revealed the stealth warrior lifestyle of the ninja. Afterwards we moved further inside the second room. Here, we saw a huge display case showing a typical black colored ninja costume, helmets, straw slippers, straw hats, swords, and various other everyday necessities of a ninja warrior. 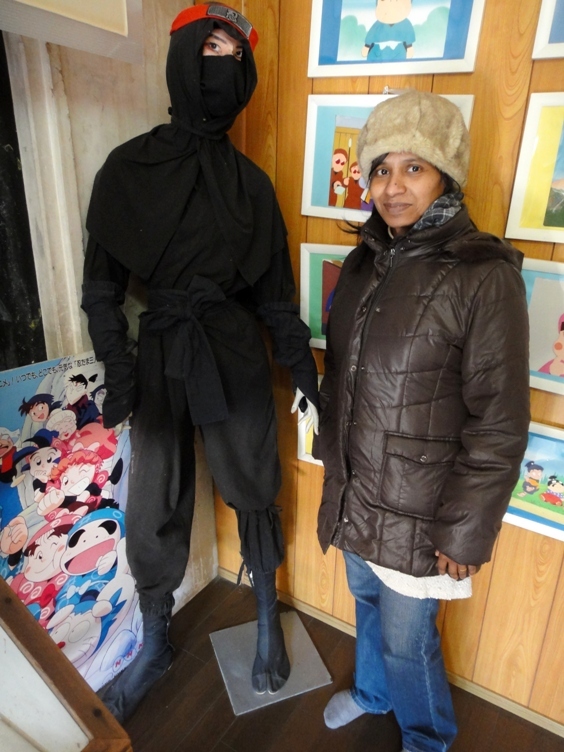 The tour guide told us that the real ninja mainly wore one of seven disguises instead of the stereotypical black costume. They could also be dressed as a Zen priest, a mountain priest, a merchant, a wood gatherer, a monk, or a Noh dancer. It was very interesting piece of information for us. Adjacent to the huge display case, there is another display area showing various kinds of tools that the ninja used. 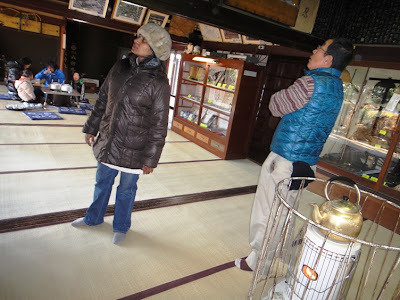 Next, we went to the fourth room on the first floor. 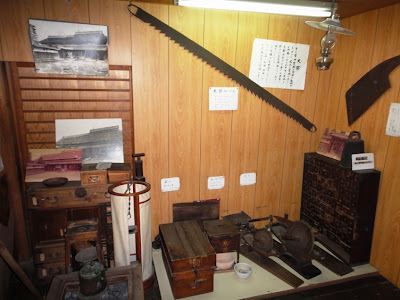 In this room there are a few display cases with an impressive display of tools and weapons used by the ninja. In the first display case, a blow tube, a gunpowder-case, Tekkokagi hand claw, and Nekote finger claws are displayed in the upper section of the case. Tsubokiri U-shaped chisels, Kasugai clamps, a Manrikikusari swinging chain with weights on the ends, and several other tools are displayed in the lower section of this display case. 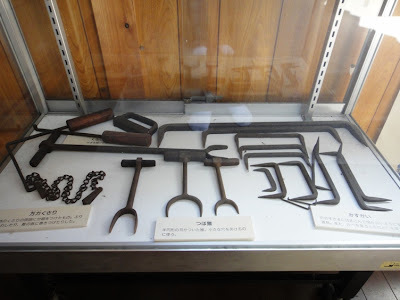 In the second display case, Kunai shovels, Shikoro serrated sickles, hooks for hoisting ropes on walls, ropes, and many more tools are displayed. 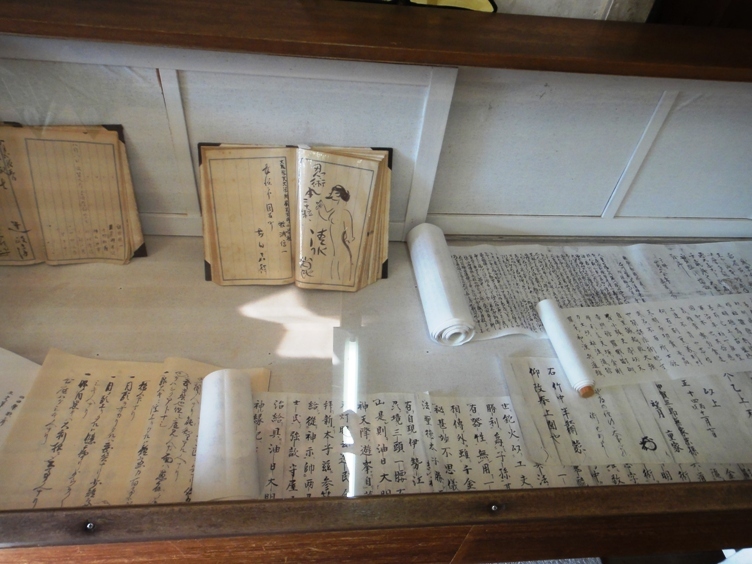 In the third display case, many documents detailing the history, tools, and techniques of the ninja are displayed. 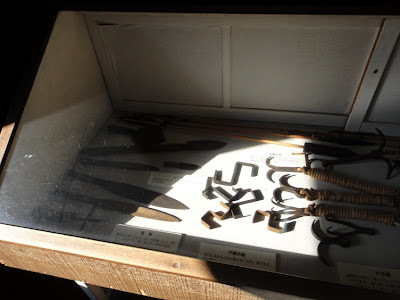 The ninja of this house were the makers of medicine as a front for their spy activities. So we saw several wooden advertisement boards for various kinds of medicines. In addition, a cute life-sized statue of a ninja is on display. 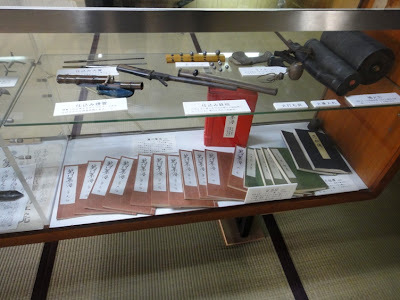 It was a great experience for us to see in details the tools and weapons that were used by the ninja. 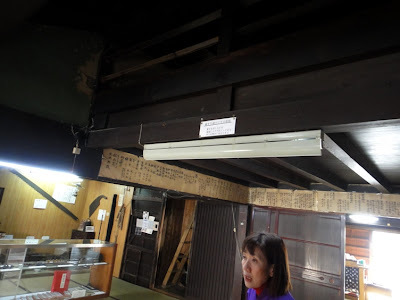 We returned back to the second room on the first floor, and saw a rope ladder and a wooden ladder on one side of this room. 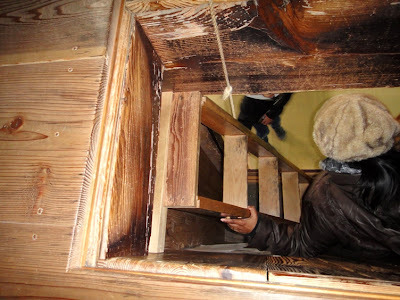 The rope ladder was ordinarily drawn up and hidden. 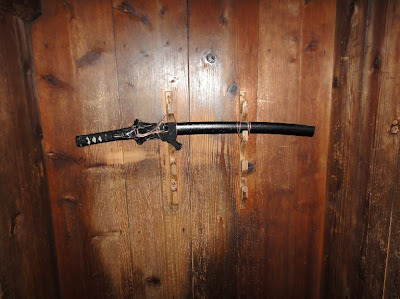 It was primarily used by the ninja to move stealthily between the different floors of the house in order to quickly escape from an intruder. The wooden ladder was used for climbing up to the second floor of the house. There is also a trap door on the floorboards below this wooden ladder where the ninja could hide. This ladder could be drawn up and hidden or left standing to lure the enemy over the floorboards that drop into a pit. 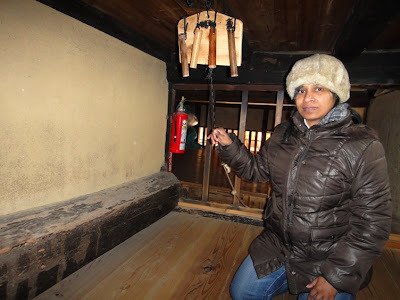 Adjacent to the wooden ladder, we saw a rope hanging till the floor level. This rope goes up to the second floor where it is connected to a noise maker. The tour guide told us that the ninja hiding under the floorboards would tug this rope and the noise maker made sound on the second floor. 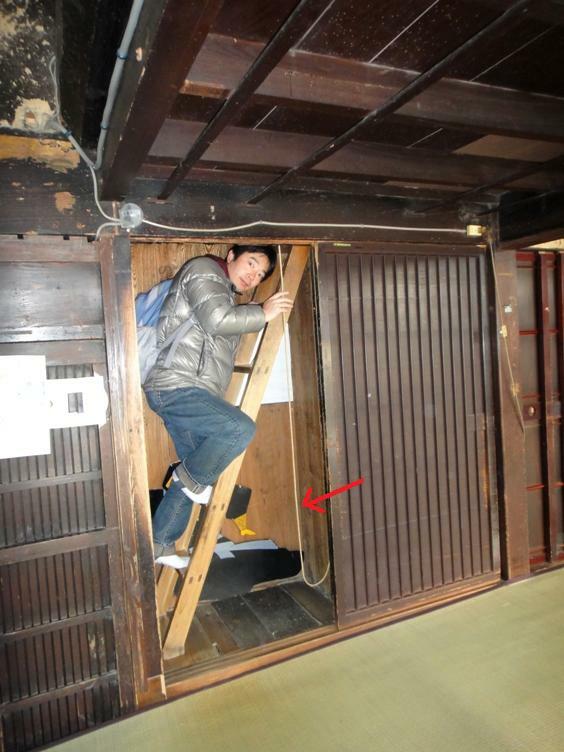 The intruder would then think that the ninja is on the second floor and go up the wooden ladder in pursuit. 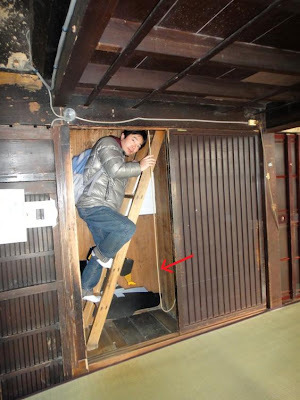 When the intruder is on the second floor, the ninja under the floorboards would remove the ladder and trap the intruder. Hubby climbing up the wooden ladder that goes to the second floor. Note the hanging rope (indicated by a red arrow) adjacent to the ladder. I am climbing up the wooden ladder. Note the hanging rope. 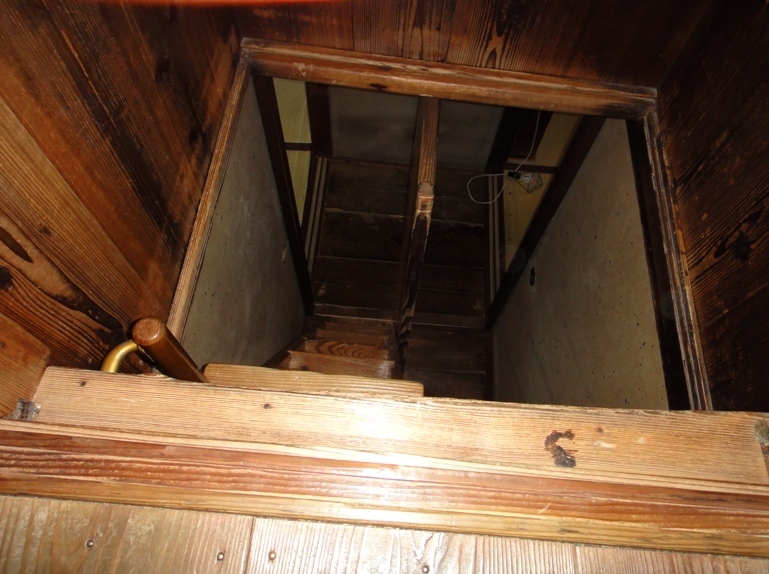 The second floor of the house has a very low height and was designed this way to entrap an intruder going upstairs. 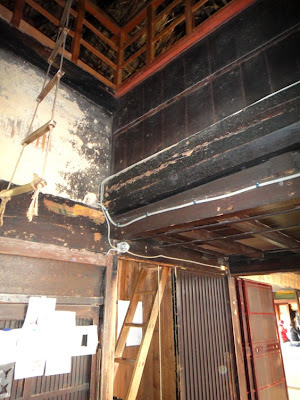 Also, we noted that there are very few windows at the second floor level of the house, and it is pitch-black inside most of the rooms on this floor. The ninja could effortlessly move in such darkness while the intruders were rendered helpless. In fact, almost all the rooms were so dark that we were able to take photos only by using the camera flash, which is fortunately allowed. 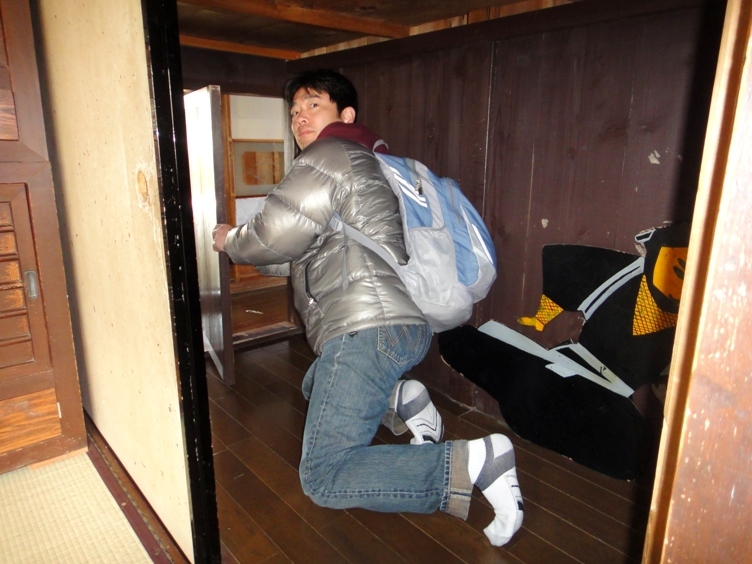 The height of the rooms is so low that we literally had to crawl from one room to the other. But it was adventurous and we loved moving stealthily like a ninja. 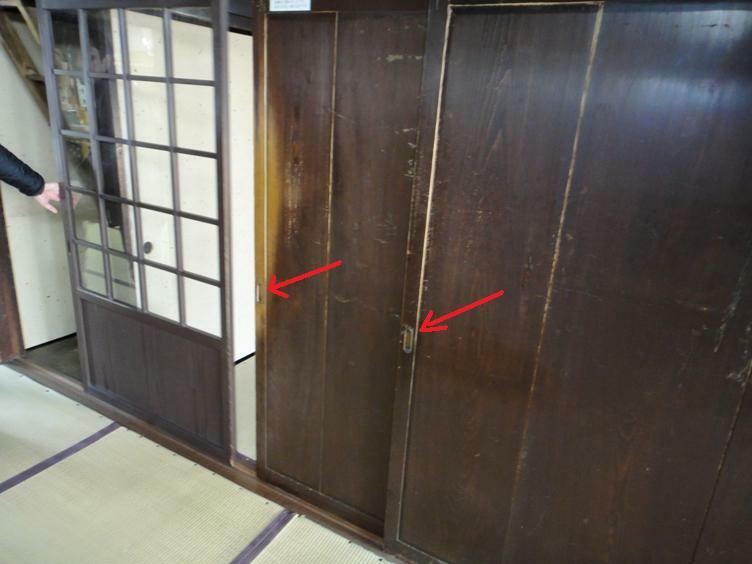 We noted that one of the walls of a room on the second floor is missing, and instead has a wooden railing only. This railing has four horizontal rods, but one of them is a bit slimmer than the other three. 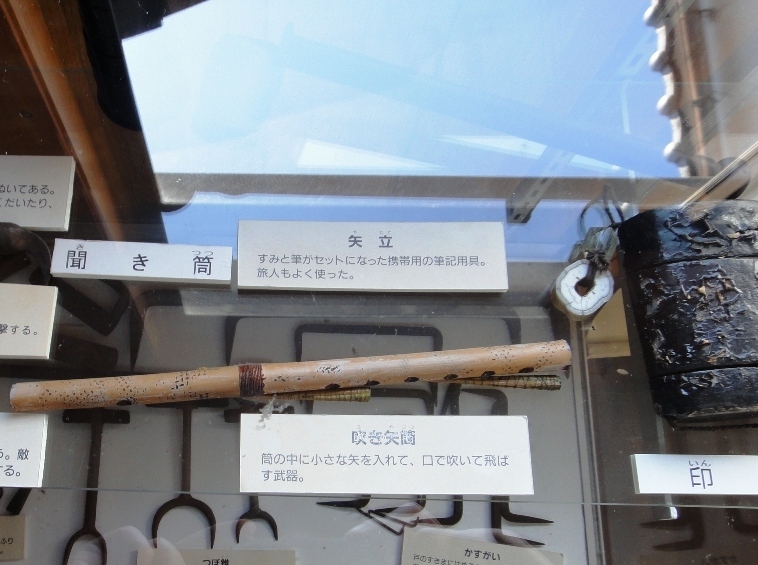 This slimmer rod is removable, which allowed the ninja to escape from the second floor. We also saw a small gun concealed as a sword hanging from the wall of a room on this floor for easy access by the ninja. 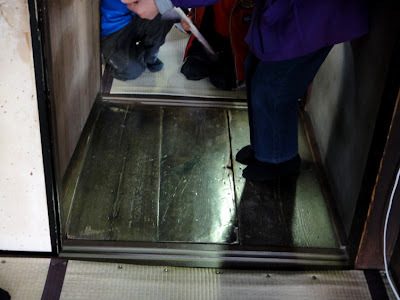 While crawling around this floor, we saw another wooden ladder leading to the first floor. This ladder looked almost similar to the one we had used to climb up. It was pitch-black but the flash camera could ‘see’ hubby looking down through a barred window on the second floor. The third floor railing and the ceiling of the house are also seen on the upper left corner of the photo. I am sitting in another corner of the same room. 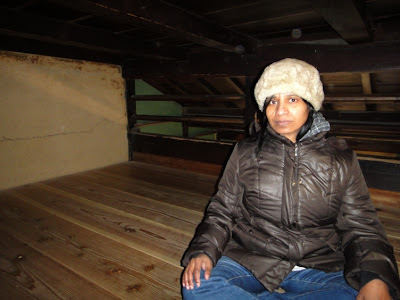 Note that there is no wall behind me and only a wooden railing is there. Next, we went to the third floor of the ninja house. There is an opening in the ceiling in one corner of a second floor room. 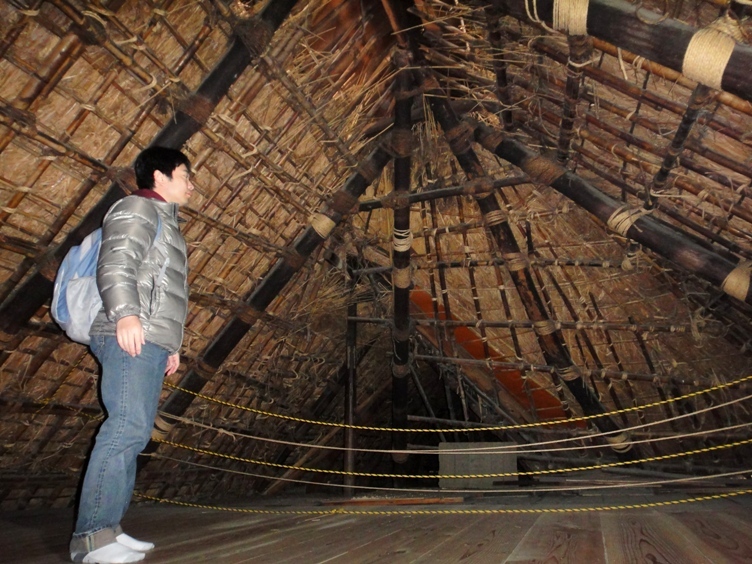 We had to push up on the ceiling of this room and pull ourselves up to the third floor. Hubby could easily climb up to the third floor but it was a bit difficult for me. 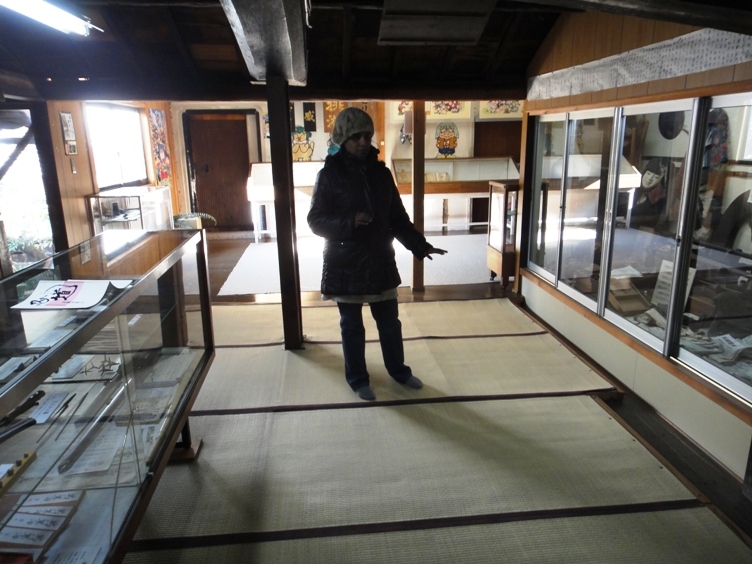 The third floor is very small with hardly any space. Here we saw that the ceiling of the ninja house is directly below the thatched roof. We moved around a bit and enjoyed looking at the ceiling of the house. 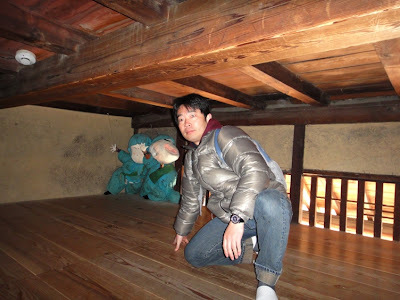 It was so funny to see hubby trying to kick a ninja doll displayed on this floor. Afterwards we went back down to the first floor. There is a small souvenir shop in the first room on this floor. 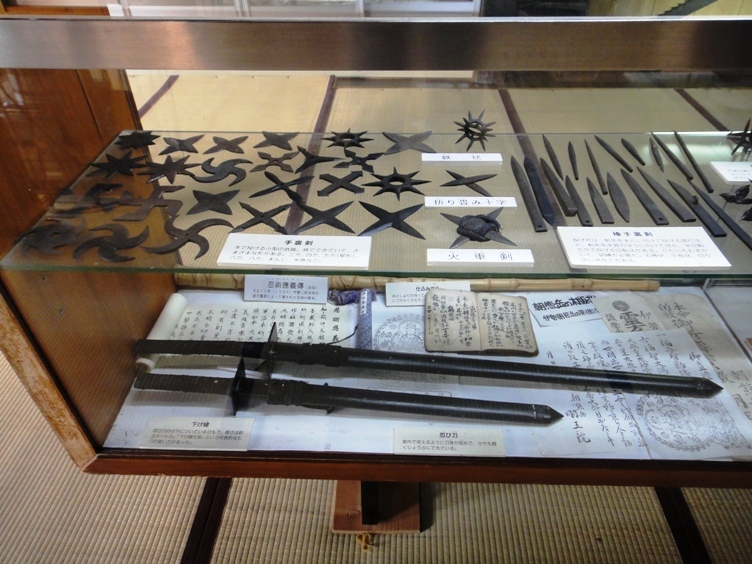 We bought a wooden ninja sword and two rubber Shurikens as souvenirs. Hubby loved the ninja house so much that after buying the souvenirs, he again went to see all the rooms on all the three floors of the house. 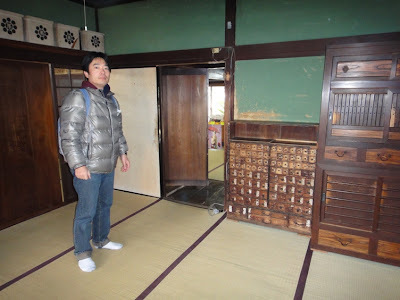 This time, he compiled a video of the ninja house along with all its historical treasures. We loved visiting the ninja house where the real ninja once trained, fought, and lived during the feudal era. 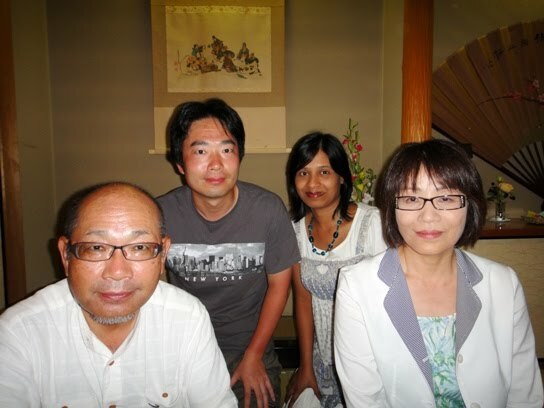 Nice post.Liked the blog.Thanks for sharing. Diferente deste, no museu de Iga as peças são dispostas de maneira bem organizada.